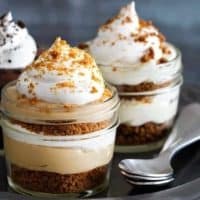 Easy Pudding Parfaits are layered with cookies, pudding and whipped cream to create a simple, but delicious weeknight dessert the whole family will love. This post is sponsored by Kozy Shack Enterprises LLC. Thank you for supporting the brands that make My Baking Addiction possible! A few weeks ago, the kind folks at Kozy Shack sent me samples of their new Kozy Shack® Indulgent Recipe™ Pudding, and this girl is In. Love. There are four delectable flavors to choose from: vanilla bean, made with REAL vanilla beans (seriously, there are gorgeous flecks throughout the pudding), dark chocolate, salted caramel, and chocolate truffle. 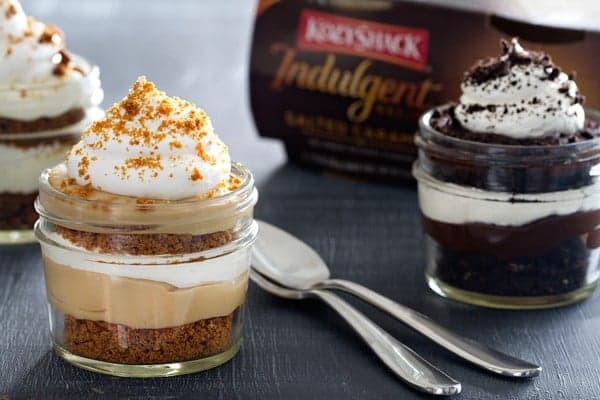 All four Kozy Shack® Indulgent Recipe™ Pudding flavors are made with premium ingredients, including real milk and no artificial preservatives or hydrogenated oil, which makes me love it even more. Eric may have found me face-deep in a chocolate truffle cup around midnight last week… but I keep telling him it was a dream. A delicious, delicious dream. Plus, he has no room to judge. We’re those people. Not the ones that have a night cap each night before bed. No, not us. We’re those people that instead, share a pudding cup. A pudding cap. Ha! This is a new ritual for us, one that started with the arrival of the Kozy Shack® Pudding samples. But since then, they’ve been in my grocery cart each week. They’re just that good! Now, you might find this hard to believe, since I’m a dessert blogger, but sometimes when people stop by, I don’t have dessert to share with them. The holidays are fast approaching, and I think a lot of us are going to find ourselves in this predicament as people stop by unexpectedly (but certainly welcome!). That’s when it occurred to me that my Kozy Shack® Indulgent Recipe™ Pudding could lead to some pretty phenomenal guest-worthy desserts. There are lots of ways you could use these delectable puddings. Simply use what you have on hand to create something spectacular. I’ve always got mini shortbread tart shells in my pantry (dessert blogger: guilty as charged), so one idea would be to simply put dollops of your favorite Kozy Shack® Indulgent Recipe™ Pudding in the shells, and top with a little whipped cream and sprinkles. Adorable and elegant. Check out the video below to see just how quick and easy they are to put together. Another way to be elegant without much effort? 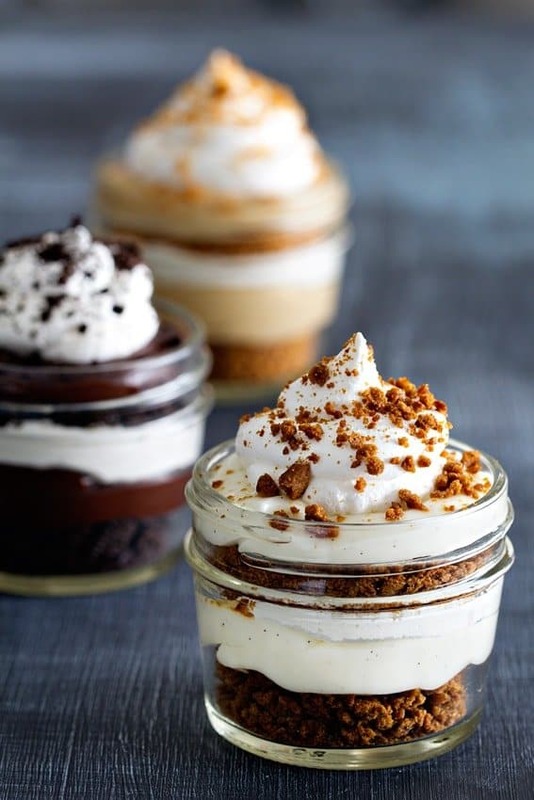 Mini trifles or easy pudding parfaits, whatever you’d like to call them. Grab your favorite small glasses, be they hi-ball glasses, mason jars, or mini trifle glasses. Now grab your favorite cookies. You have cookies in your pantry, don’t you? Chocolate sandwich cookies, gingersnaps, vanilla wafers – any of these will create the perfect base to your pudding trifle. And brownies would be ah-mazing. Crush or crumble your cookies, and choose a matching pudding. Then add some whipped cream and any dessert sauces you have on hand – chocolate syrup or caramel topping for ice cream work here. Hello, layered, elegant, looks-like-I-knew-you-were-coming desserts! 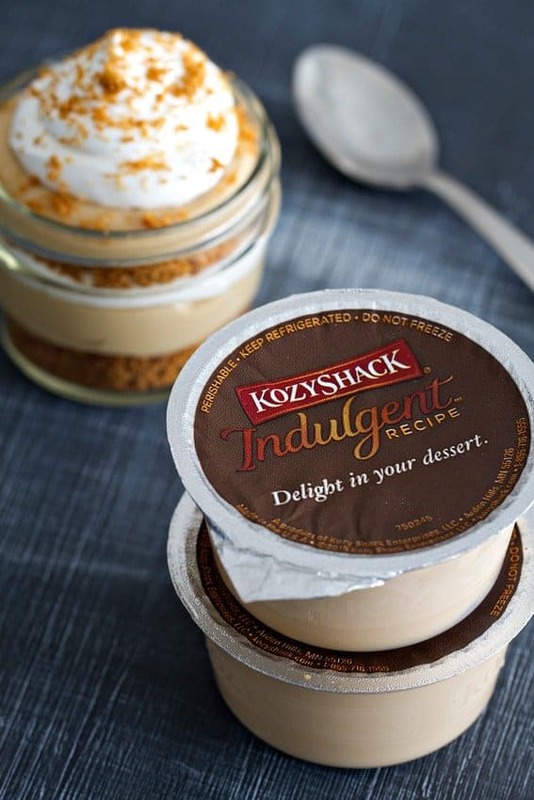 It’s not hard to create a pretty dessert for friends when you’ve always got Kozy Shack® Indulgent Recipe™ Pudding in your refrigerator. They’re so good, I’m pretty sure tossing a cup at each guest would work almost as well as creating a mini parfait, but serving these elegant treats would probably be more socially acceptable. And pretty too. Video created in collaboration with Emily Caruso. 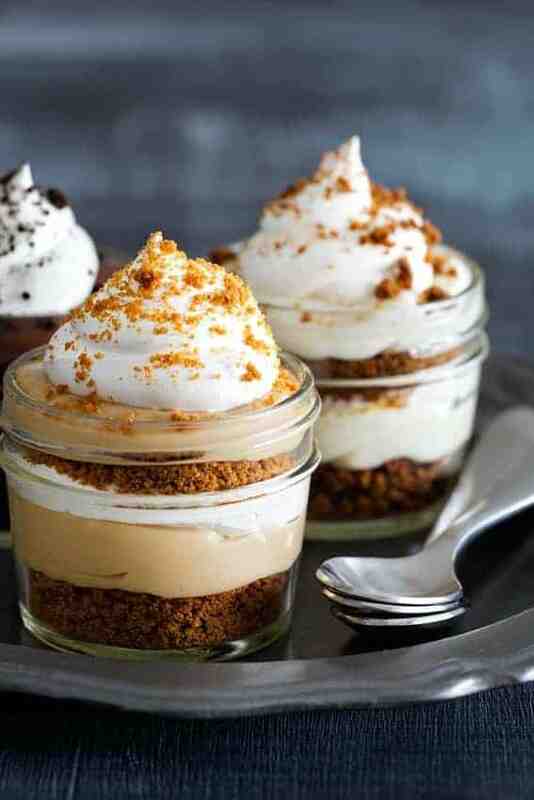 In a small mason jar or serving dish, layer crushed cookies Kozy Shack® Indulgent Recipe™ Pudding and whipped cream. If desired, garnish with additional cookie crumbs. Love this, Jamie!! So cute! What a stinkin’ adorable idea. I’ve been buying those Indulgences puddings since I first saw them. Incredibly good, and very much a habit in our house now. So good, like almost too good! You must try the vanilla bean – it’s my new fave! Thanks for stopping by! OM goodness, I love these. Any dessert in a jar is the best! I love a yummy treat that doesn’t take hours to prepare. These are super cute! My kids will love them. Salted caramel!?!? Sign me up please! Those layers are calling my name! I can’t wait to try the vanilla bean pudding…anything vanilla bean is a win in my book! These are too cute for words. I love that I have three recipes to choose from. Pass that pudding! Homemade pudding is great, but OMG all the stirring! I very rarely have time…THIS on the other hand…is a busy mom’s dream. I’m adding the vanilla bean flavor to my grocery list NOW! !